The Nissan Qashqai has been a firm hit with buyers since the first version went on sale more than a decade ago. In fact, it’s so popular it outsells the Vauxhall Astra, Mercedes A-Class, and Volkswagen Polo. That's because it was the first successful crossover car, which took the bits that owners loved about hatchbacks such as the Ford Focus, - like comfort, good fuel economy and nimble cornering - and combined them with the higher driving position of an off-roader. Since then, there's barely a car company that hasn't followed suit: even Ferrari is planning a crossover. But the Qashqai remains the most popular car of its type in Britain, and an update in summer 2017 brought about design tweaks to help it keep pace with newer rivals. Outside, these included a new front bumper and headlights, while on the inside the quality of materials was markedly improved. It continues to be updated, with the option of a semi-driverless system, which Nissan calls ProPilot, as well as a much improved touchscreen and a new 1.3-litre petrol engine that is both cleaner, and smoother than the engines it replaced. The interior is practical, with plenty of cubbyholes for storage and space for two adults to sit comfortably in the back (although it's cramped with three). A pair of thinner front seats introduced in 2017 has also increased rear legroom, while headroom is sufficient for most adults. There are two sets of Isofix mounts in the back for securely mounting child seats. That practicality stretches to the design: don't expect the drama of the Peugeot 3008's digital cockpit, or the retro style of the Mini Countryman. Instead, the dashboard has a straightforward layout that's clear and easy to use. Useful equipment includes an optional heated windscreen and 360-degree camera, which gives drivers a view round the entire car when manoeuvring in tight spots. It comes as standard on well-equipped N-Connecta cars. The official price starts at just under £20,000, but there are plenty of new car discounts to be found. 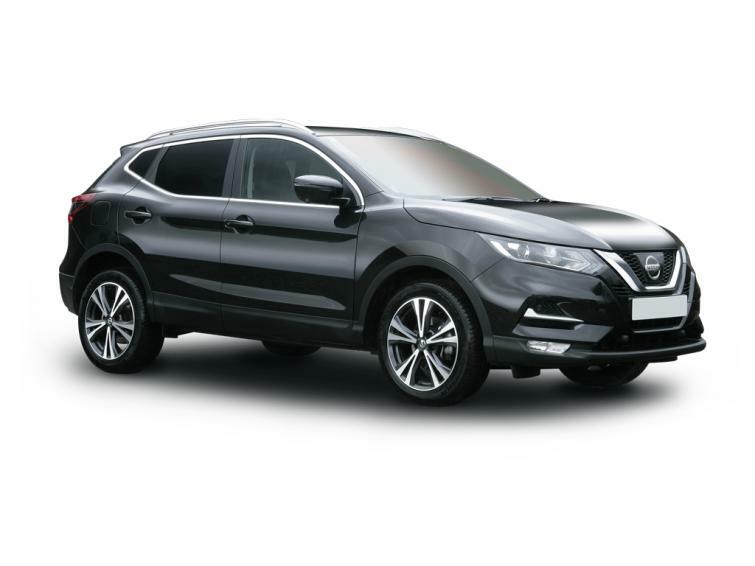 Nearly-new Qashqais cost start at £13,990 or from £194 per month on finance from BuyaCar. Prices for older used models are as low as £8,399 or £136 per month. It’s just as well prices are cheap, because the Qashqai’s rivals have overtaken it in some areas. The car's dashboard touchscreen (on all but entry-level Visia cars) was redesigned, from October 2018, becoming more responsive to touches and gaining Apple CarPlay and Android Auto for easy use of phone apps like Google Maps, Waze, and Spotify. It's much better than the dated design of earlier cars but still lags behind the bright, crisp displays in a Skoda Karoq, Volkswagen Tiguan or Kia Sportage, which also respond faster to prods of the finger. Space is lacking compared with the best: a single bulky baby buggy fills much of the Nissan's 430-litre boot (which expands to 1,598 litres when the split-fold rear seats are folded down). That lags behind the Renault Kadjar (472-litres), Mazda CX-5 (506) and Peugeot 3008 (520). The Nissan puts quite an emphasis on comfort. It's not as smooth as a Volkswagen Tiguan or Peugeot 3008 but does a good job of remaining settled on bumpy roads. Around town it’s supple, but at motorway speeds it can be fidgety and bouncy, especially on the 19-inch alloy wheels found on the Tekna and Tekna + models. The light steering requires little effort and encourages the driver to make calm progress – if only because it’s no fun to drive quickly in corners, where it leans too much for comfortable progress. It drives much like a Renault Kadjar, which shares its mechanical parts with the Qashqai. For sharper, more stable cornering and a more involved feel, the Mazda CX-5 and Seat Ateca are better choices. On longer journeys, some versions of the Qashqai now allow drivers to relax a little more with Nissan's partially driverless technology, which uses adaptive cruise control, that monitors traffic ahead and adjusts the car's speed to keep a safe distance from any vehicle in front. It's combined with steering assist that's linked to front-facing cameras, enabling it to steer the car automatically to keep within a marked lane. This means that the Qashqai can effectively drive itself on motorways and dual carriageways, but the driver has to keep their hands on the steering wheel and remain alert, as the technology can't deal with every situation - so it's only of limited use. It's also an expensive option, as it's only available on high-specification Tekna or Tekna+ cars. It's a £495 extra as part of the Drive Assist Pack on manual diesel cars. Automatic diesels can be fitted with a slightly more advanced ProPilot pack, costing £795, which can automatically bring the car to a halt in traffic jams and start moving again. All cars benefit from a high level of safety, and the Qashqai was awarded a full five stars for crash protection by the independent Euro NCAP safety organisation. Four-wheel-drive versions of the Qashqai are less likely to get stuck in slippery conditions and these models (as well as those with the most powerful petrol engine) have better suspension for a slightly more comfortable ride. Both manual and automatic cars offer smooth acceleration, and you'll get real-world fuel economy of around 50mpg from the most efficient diesel (ignore the unrealistic official figure of over 70mpg). The most frugal engine and Acenta trim is a decent combination: it returns around 50mpg in real-world driving and - with this engine only - the Acenta specification includes the smart vision pack, which adds front and rear parking sensors, as well as automatic emergency braking. You'll save a fair bit of cash by opting for petrol rather than diesel (based on the manufacturer's price), and you won't have to worry about any future diesel charges. The latest 1.3-litre engine delivers more power without increasing fuel consumption. N-Connecta cars come packed with extra safety equipment, sat-nav and 360-degree camera. The most powerful diesel Qashqai isn't the fastest (that's the 1.6-litre petrol), but it offers the most useful performance in a car of this type: a big shove of power that's useful for towing or carrying heavy loads. The fastest Qashqai is faster than the average family car but performance still isn't spectacular. You might as well save £1,500 and get a slightly less powerful petrol engine. Tekna+ trim is lavish, but makes the Qashqai the same price as a Land Rover Discovery Sport. January 2016 Acenta Premium, n-tec and n-tec+ trims are replaced with N-Connecta offering sat-nav and extra safety equipment. March 2018 Propilot and Drive Assist Pack become available, introducing semi-driverless technology. The Pilot One special edition features the technology. October 2018 A new 1.3-litre petrol engine replaces the 1.2- and 1.6-litre engines. DCT automatic introduced for higher-powered petrol cars; touchscreen updated with Apple CarPlay and Android Auto. Qashqais fitted with an automatic gearbox are badged xTronic or DCT, which stands for dual-clutch transmission, a more advanced gearbox with faster and smoother shifts. Petrol-powered Nissan Qashqais have always made a strong case for themselves thanks to their lower purchase price and reasonable fuel economy, compared with other petrol crossovers. The problem with the cheapest 1.2 DiG-T models, sold up to autumn 2018, is that the engine could feel underpowered, particularly when accelerating at high speeds. This new 1.3-litre is a vast improvement over the old 1.2-litre, mostly because it isn’t anywhere near as slow. Not only is it quicker in 0-62mph testing, but more importantly, it has more thump for more of the time. Overtaking on a B road no longer requires months of planning. New car buyers can choose from a DiG-T 140 model, with 140 horsepower (25hp more than the older engine), or a more powerful DiG-T 160. Both return 53.3mpg, according to official figures, which falls to around 38.5mpg in real-world driving, according to estimates from the Equa Index, which publishes realistic mpg figures based on detailed road tests. Carbon dioxide (CO2) emissions are 121g/km for both engines, making them competitive company car choices. The more powerful DiG-T 160 engine is also available with a new dual-clutch transmission (DCT) automatic gearbox. Once again, top points for Nissan. This automatic is much better than the old one, which was noisy, making the car feel like you were constantly over-revving it. The new type feels feels willing and ready, as well as smooth and quiet. It also gives you the option of changing gears yourself, by palming the gear shift to the right, then pushing it down to change down a gear, or up to change up a gear. Despite the efficient petrol engines, diesel Qashqais are more economical still. If you’re regularly travelling long distances, there’s a good chance that the fuel savings from a diesel will more than make up for the higher purchase price. The 1.5-­litre diesel is the least powerful engine in the range, but it doesn't need revving hard, so feels livelier. The official fuel economy figure of more than 70mpg is impressive, but the reality is closer to 50mpg when the car is driven on the road. Less efficient, but more powerful, the 1.6-­litre diesel is a good choice for those who expect to work their Qashqai hard, towing loads or covering lots of motorway miles. It's the only engine available with four-wheel drive, and you can also opt for an automatic gearbox (but you can't have both together). Expect around 46mpg from the manual car and 43mpg from the auto. Trim levels on the Nissan Qashqai have remained relatively similar, but did have different names on earlier models and the equipment included as standard has changed over the car's life. See the used section for more details. The small steel wheels fitted to the least expensive Qashqai Visia don't look bad but they are a little dowdy, compared with higher trim levels. Inside it looks dated too, without a dashboard touchscreen. The current specification has the essentials, though, with air conditioning, cruise control, digital radio, Bluetooth and power­-adjustable heated door mirrors all coming as standard. Acenta has better-­looking 17­in alloy wheels, rain­-sensing wipers, automatic headlights, dual-zone climate control, so that both front passengers can select the temperature of the air around them, and a fold-down armrest for the rear seats. The most recent cars, only available from October 2018, also come with Apple Carplay and Android Auto as standard, so you can control messaging, phone, navigation and audio apps through the touchscreen or with voice commands. Nissan Qashqais can be upgraded with equipment packs, which offer a series of options for less than if they were bought separately. The Smart Vision Pack is good value, at under £600. It includes automatic emergency braking, front and rear parking sensors, headlights that automatically switch to main beam when the road is clear (Acenta models only), and a warning if you drift out of the white lines on the road. It's standard on Acenta cars with the 1.5 dCi engine. Acenta Premium costs around £500 more than Acenta cars from new and offers a visible upgrade over standard Acenta cars, thanks to the 7in dashboard touchscreen. On cars built before October 2018, this looks dated, but the graphics are much improved on more recent cars. A rear view camera is also included as standard for safer reversing. Qashqai N-Connecta cars costing almost £2,000 more from new than Acenta cars. They add a dashboard touchscreen with sat-nav and an excellent 360-degree camera, which gives you a bird's-eye view all-round the car, reducing the chance of clouting kerbs or bollards while manoeuvring. The Smart Vision Pack comes as standard, as do bigger 18in alloy wheels. The Drive Assist Pack is optional, enabling the car to accelerate, brake and steer itself on motorways and dual carriageways, but you'll need to be ready to take over at any point and keep your hands on the wheel. Beyond that, for a further £2,000, the Tekna trim offers leather seats, and large 19­in alloy wheels. You can downgrade to 17-inch wheels, which give a more comfortable ride, free of charge. The Tekna+ trim added in 2017 includes (for an additional £1,000 compared to Tekna models) luxurious nappa seat leather with ‘3D quilting’, lumbar support in the front seats, satin silver door mirror caps and roof rails, and an eight-speaker Bose sound system. Reliability hasn’t always been the Qashqai’s strong suit but it has improved in recent years – in the 2018 Driver Power customer satisfaction survey it finished a respectable 22nd out of 75 models tested. Owner feedback suggests that earlier cars from the current generation were more troublesome. Electrics and software problems were most common issues; they won't necessarily leave you stranded but could mean frustrating extra visits to your dealer. If you’re buying a used Nissan Qashqai, it’s wise to find one with some warranty. The standard warranty covers just three-years and/or 60,000 miles, which isn’t as good as many of its rivals – especially the Hyundai Tucson (five years) and Kia Sportage (seven years). The popularity of the Nissan Qashqai means that it doesn't plummet in value as soon as it's delivered: after three years, it's predicted to still be worth just under half (45%) of its new price. Even so, it has been four years since the current model first went on sale, so there are increasing numbers of second-hand cars and some good used Nissan Qashqai deals, particularly on better-equipped cars that lose more of their value. Prices start at £8,399 on BuyaCar, or from £136 per month with finance. The current N-Connecta specification replaced n-tec+ in early 2016. These older models come with a 360-degree camera, panoramic sunroof, automatic emergency braking and automatic folding mirrors and cost from £10,480 or from £159 per month. The Nissan Qashqai Acenta Premium is also worth seeking out, as it's a sizeable upgrade equipment over the Acenta. Extra equipment includes a touchscreen with sat-nav, a reversing camera and digital radio (which wasn't fitted to early Visia and Acenta models). it also includes the Smart Vision Pack with features like automatic emergency braking and front and rear parking sensors. This pack is also standard on more recent Acenta 1.5dCi 115 models. Cars built before the summer 2017 update should be cheaper than more recent ones. The older cars look slightly different, with a grille that's separate from the number plate. Inside, they have a round round steering wheel, rather than the flat-bottomed one on newer Qashqais. The petrol engine line-up’s significant shake-up in autumn 2018 meant that the old 1.2 and 1.6-litre DiG-T petrol engines were no longer available. As a used buy, the 1.2 is probably the better bet of the two, but if you need to haul big loads over long distances you’d almost certainly be better off with the extra power of the 1larger engine. The Qashqai was one of the first crossover cars to hit the UK - typified by its high driving position and economical engines. 2017 brought about design tweaks to help it keep pace with newer rivals. Outside, these included a new front bumper and headlights. To drive, it's nothing to write home about. It's comfortable enough for most people, and comes with petrol, or diesel engines. The interior is practically minded. Everything is where you expect it to be - but rivals do have more pizzazz. Cars made after October 2018 benefit from Apple CarPlay and Android Auto, which is a marked improvement over Nissan's own entertainment system. In the rear it has ample space for three kids, or two adults. Headroom is good, and with the optional panoramic sunroof, it feels light and airy in here. Space is lacking compared with the best: a single bulky baby buggy fills much of the Nissan's 430-litre boot (which expands to 1,598 litres when the split-fold rear seats are folded down). It's easy to spot Nissan Qashqais that were made before the 2017 update. Unlike later cars, their grille is separate from the numberplate. On newer cars, it runs from the Nissan badge to the number plate in a v-shape.